Isao Suzuki is the grand master of jazz in Japan. He is a bassist, multi instrumentalist, composer, arranger, producer and bandleader. Isao Suzuki was born on 2nd January 1933 in Tokyo. 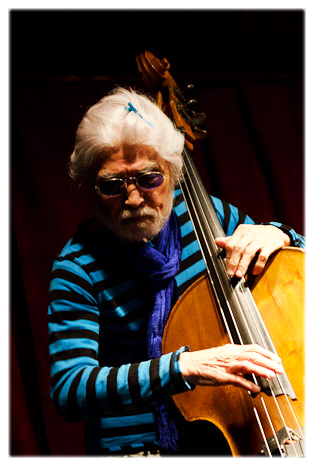 His musical career began in 1956 when he played double bass at a U.S. military base in Tokyo. In 1970 he went to New York at the encouragement of Art Blakey and joined his lengendary group JAZZ MESSENGERS. During this time, he worked and recorded with Thelonious Monk, Charles Mingus, Ella Fitzgerald, Wynton Kelly, Bobby Timmons, Jim Hall, Ron Carter and others. After his return to Japan, Isao has been contributed to the development of many young musicians and enlisting them as members of his band 'OMA SOUND,' which has kept his sound on the cuttingedge of progressive jazz. On his solo album "Self-Portrait" (1980), Suzuki played 20 or more instruments, sealing his unique standing in the Japanese jazz scene. Now, with more than50 albums released, including several winners of the prestigious Japan Jazz Prize award, Suzuki's reputation as a unique leader of jazz in Japan has been secured. He has been chosen 20 best jazz musicians in the world by the Internet radio called "Radio Jazz International of Switzerland" and has gotten of "JAZZ GOD FATHER." © isaosuzuki.com All Rights Reserved.